So a friend of mine has been doing some amazing things this year and recently asked in her blog, “What would you do if you knew you could not fail?”. That got me thinking on so many levels, but mostly about this. Why are we so afraid to fail, and why do we assume we will fail? How many times have you not done something because you were afraid to fail? I’m not generally afraid of failure. Despite not liking where my weight is, I have a pretty high level of self confidence. And yet, when it comes to weight loss, the idea of failing is enough to deter me. Maybe because I have failed at this so many times before? But what if, this time, I knew I could not fail? How would I go about things differently? I work for the largest federal labor union in the country and have spoken on behalf of the entire organization in interviews with CNN, the Washington Post, New York Times and many others without a second thought. It never occurred to me that the interview wouldn’t be successful, or would have a negative result. I have stood in front of hundreds of people and trained them on writing, editing and media. I am by no means an “expert” on any of those, but I never once thought that my training would fail. And oh yeah, I’m helping raise a little boy with no clue about parenting, and while I’m not sure that I get everything right, I for sure have never thought that I would fail as a parent. And yet, here I am with weight loss. I’ve done it before. I know it can be done. Better still, I know I can do it. I also know that every time I have done it, I’ve been right back where I am now. But does that mean that I failed, or just that I didn’t try–and what’s really the difference? Here’s an example of my weight loss history: eat right, exercise, lose weight and feel great, get too confident, eat an extra bite here and an extra bite there, slack off on exercising, gain a pound … and another … and another … and so on. I didn’t fail to lose the weight; I failed to keep it off. Hmm, maybe that’s not failure but just cockiness and laziness? Whatever you call it, it’s enough to give me pause when I think about doing this all over again. But let’s think about this. What if I eat right and exercise, and get the healthy body I want–but then I keep eating right and exercising, and stay healthy-and oh yeah, never have to go through this again? That sounds like a really good plan to me. 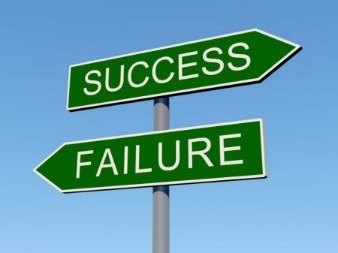 So maybe by taking the option to fail out of the equation, I can find success. It’s got to be worth trying, right?